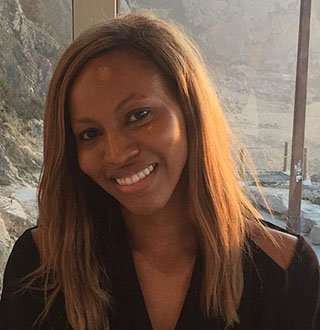 Zain Asher admitted that her married life with a fellow journalist was soaring into a new level. The happily married journo had excellent news to share after showing up at work with a surprise. The 34-year-old is a British news anchor at CNN International who anchors CNN Newsroom on Friday and Saturday. Currently based in New York City, the presenter is also seen regularly in Quest Means Business and CNNMoney with Maggie Lake. Asher graduated from Keble College, Oxford University in 2005 with a degree in French and Spanish. She later graduated from Columbia University's Graduate School of Journalism in New York City in 2006. Post graduation, she became a full-time reporter for Money, where she wrote personal finance articles. Then she went on to become a TV reporter at News 12 Brooklyn, reporting from Brooklyn, Bronx, and Connecticut. She joined CNN in 2013 as a business correspondent. She was based in New York City and lent her expertise in finance to various programs in the network including Quest Means Business and CNNMoney with Maggie Lake. She also continued writing columns for the Money Magazine in addition to financial reporting for CNN. As of now, she is the regular host of CNN Newsroom on the weekends. Born on 27 August 1983 in Balham, England, to Nigerian parents of Igbo ancestry, she identifies herself as a devout Christian by religion. Their single mother raised her, and her siblings with great efforts after their father tragically passed away when she was just a child. One of her siblings includes her older brother and famous actor, Chiwetel Ejiofor who won an Oscar nomination for his excellent performance in the Academy Award-winning movie 12 Years a Slave in 2014. The following year, she was provided with the opportunity to report that her brother had been nominated for an Oscar, live on CNN. "I'm sorry, I've never cried on TV before!" She told how the nomination was particularly unbelievable for her mother who grew up in poverty and raised her children all by herself. However, she felt sad that their father wasn't there to witness the fantastic news. Two years later, it got better for Asher as she was proposed by her boyfriend Steve Peoples, a political journalist for AP. And happiness came in bundles for the African descent actress as a year later she and her boyfriend got married. The lovers tied the knots in an intimate wedding ceremony on 30 September 2017 in Lisbon, Portugal which was attended by her family members and close friends. The bride wore a unique dress made by Ferona which took over 3000 hours to craft whereas the groom looked quite charming with the classic black suit with a white shirt matched up with black shoes. After a whirlwind 2017, her next year just got much better as she announced that she was pregnant. Zain Asher announced that she was expecting her first child with husband Steve Peoples. She shared her adorable baby bumps with her fans on her Instagram account. However, her dedication to her work was on display after her pregnancy as she was diligently reporting to her job despite having a clearly visible baby bump. She’s been coyly showing up for work while rocking her baby bump and her colleagues have been equally receptive of her pregnancy as they arranged for her baby shower in the network.